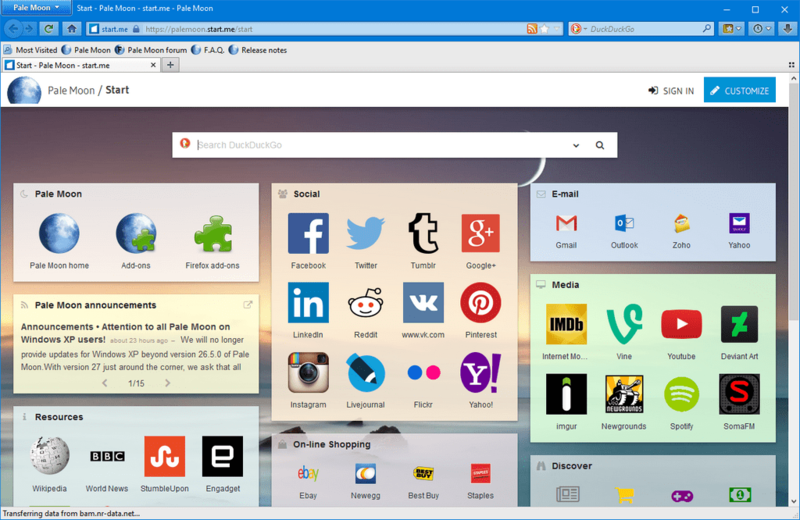 Pale Moon is a fork of a previous version of Firefox focusing on efficiency and ease of use. Unlike Firefox, there is no support for accessibility features or parental controls. How to extract: Download the "Portable" self-extracting package and extract to a folder of your choice. Launch Palemoon-Portable.exe. @Happy.Camper2 - You can probably use New Moon by Roy Tam. Check the MSFN forums for a link. Just wondering...Do any of you fine folks have the Palemoon Portable Browser v28 installed on a Vista Home Premium 32-bit OS? Well, if you do, would you please tell me how? I've DL'ed a couple of v28's and installed them and they wouldn't launch. To my knowledge of what I've been reading, Palemoon v28+ is for Windows 7+. Please tell me your tips & tricks so I can go back to using Palemoon. Thanks so much. Pale Moon 28 essentially uses Firefox 52 ESR as a base. Likewise for SeaMonkey 2.49. AndTheWolf: I'm not sure how to describe this browser outside of it's relationship to Firefox. It looks like Firefox, it supports some Firefox plugins, and the elements on the Technical Details page all reference things that have been added/removed from Firefox. I don't think you can still describe Pale Moon as "modified version of Firefox", anymore than you can call a zebra a modified version of a horse. They share a common ancestor, but have grown so far apart the current versions can't even use each others extensions. Looks like webfork fixed that. Both links are a 404. Very useful program, I have been using Sea Monkey for awhile due to the speed of changing sites. I curious to see how Pale Moon Portable compares. I will let you know, more will be reveled. Sadly the latest versions no longer support WinXP. As of Firefox 49, Firefox requires SSE2 just like Pale Moon. Thus, there are no longer differences in system requirements between Firefox and Pale Moon. I dropped all the text about Pale Moon's system requirements. Just a quick addition to my previous comment: Seamonkey still has incompatibilities with some Firefox add-ons, but fewer than Pale Moon. Most of the time, you have the option to "install anyway." > I updated to Pale Moon 25.0.0 and found out AdBlock Plus no longer worked. Sadly, Pale Moon is going to have a lot of incompatibilities from here on. The fact that it doesn't work with the most popular add-on for Firefox is pretty telling, and the Pale Moon developer has placed responsibility on the heads of add-on developers, rather than trying to work around the problem. Anyone looking for a more "old fashioned" approach to Firefox might want to look into Seamonkey. And like Pale Moon, Seamonkey doesn't suffer from the Chrome-like "Australis" design! The Atom build of Pale Moon Portable (available on the download page) still works with XP. Also there is a v25 compatible version of AdBlock Plus at https://addons.palemoon.org/extensions/privacy-and-security/adblock-plus/. However there are too many other non-working extensions for me to upgrade to v25 atm (a list is being maintained at http://addons.palemoon.org/firefox/incompatible/). Apart from ABP it seems the Pale Moon developer is relying on add-on developers to make them compatible with Pale Moon, so it's probable a lot of these will remain incompatible. The publisher is quite right, of course. __philippe: The publisher himself has this to say about it: "Not recommended: stay on Pale Moon 24.7.2. With the release of Pale Moon 25.0, simply 'not upgrading the browser' is not recommended because the previous major version will not receive updates or further support. We simply do not have the manpower or resources to continue updating and maintaining multiple different versions of the same product. If you stay on Pale Moon 24.7.2, you will not receive any security and stability updates that the current version receives, and you will put yourself at (even greater) risk." Please note the most recent Palemoon 25.0.0 will NOT run under WinXP any longer. "This is a major update including a rendering engine overhaul and a number of very important fixes." "This is a security and bugfix release, to address outstanding known issues and streamline browser identity." Palemoon v24.4.1 (2014-03-19) released. "A small security and bugfix release." - Bugfix: the new status bar code in 24.4.0 had a bug, preventing the downloads panel/window from opening when clicking on the download status indicator. There may have been a few other, similar small usability bugs in the same code that have now been fixed. -Feature update: Selecting "Warn me when closing multiple tabs" in the Options window will now apply both to closing a window and closing other tabs in the tab bar. - Bug #940714 - Add an RAII class to make synchronous raster image decoding safer. Australis isn't to bad but is pretty much a chrome rip off. In version 29 with Australis they have now added an option to show the titlebar or not. Only issue I, and many others, have with Australis is the space in the GUI and no option for small icons any more. @carbonize - My belief is Moonchild is going to keep his UI exactly the same as it is currently. I use Firefox most of the time now, but I will be getting rid of Australis with an addon when it hits. @freakazoid - I think Moonchild needs to remember they are supposed to be just a fork not a redesign. Wonder what he intends to do when Australis goes live. Important update to add support for TLS v1.2, fix bugs, update security and add new features. A minor bugfix release to address some issues with new code in 24.3. - Fine-tuned the title-bar title text position to work a little better on Windows 8 systems. starting when using the classic download manager. - Security fix: Bug 945334 - Fix runnable pointer holding. - Merged Linux-specific theme code into the source tree for the pm4linux project. A fairly significant update with feature updates, bugfixes, and security fixes. - Fix for some status bar localizations not working and giving an error. - Implementation of an optimized QuickFind routine. - Implementation of per-zone user data handling. - Security fix in the JPEG library. - Security fix in web workers. shodan816: Add a batch file to kick off the program then delete the empty folders the progam leaves behind. Alternatively start the prog off inside a batch shell and change the %appdata% folder for that batch shell. @sps - It's up to people in TPFC to add new programs. You have the ability to add it yourself; there should be an "Add Entry" button in the top right-hand corner of the page. It's by the same author as Slimbrowser, but uses the Webkit engine instead of Trident (IE engine). FYI, x64 version is 57.5 MB. I've updated the listing to reflect this. Other than those locations, are there any other places where Pale Moon Portable leaks? You can call this version 'Portable' all you want, but it is NOT PORTABLE! Most people define portable as not writing to the client's system, or at least not leaving a trace once the application is closed. This version fails on both levels. I fix computers for a living and my clients do not want remnants of my apps left behind when I finish with their PC's. Other portable browsers, specifically SlimBrowser are truly portable. I've been using this as my main browser for a year now. Never had any problems. I like it because besides the speed increase, the author has a cautious approach to new features and designs in Firefox. Ditto I gave up as it is fast but buggy as a wisconsin summer day-kept saying extentsions were not compatable with this version! The only extension that isn't compatible is Status-4-Evar. The rest work fine for me; I should note that I have plugin compatibility disabled. I have tried many versions of this browser and gave up,yes it is fast but very buggy,especially with extensions and themes,both install fine then next time you run it it says certain themes and extensions are not compatable with this version!Yikes! @midas - Weird... it's working fine for me! @mnx - Interesting indeed! You might want to let the Pale Moon developers know at forum.palemoon.org. v15.0 - Just in case anyone else has this problem: (I'm running this on Win 8) After d/l, clicked on app to launch, but it would not progress. The PM site says first launch of their portable will be slow, about 30 seconds, but 5 minutes later it still wasn't launching. No way to kill it, not even from Task Manager, I rebooted. Tried it again...same results. Then, before the next attempt, I turned off my internet connection. BOOM! Extracted and works just fine. So, there's something hinky with their self-extractor and internet access...at least on this version. v12 of Pale Moon comes with an update to the portable launcher. Acording to the dev, it is recommended to make a fresh install (with a copy over of your profile files if desired) and not use an in-place upgrade. More info is available on the download page. @emka - You'll have a better setup than I do to test since I have Firefox installed on my com. Feel free to edit the "Stealth" entry. I've never had any Mozilla or derived product on this machine before and I have never seen this folder in my AppData before. It was on Win7x64 with the x64 version of Pale Moon. I opened the add-ins tab to check whether it could find the flash plugin I have installed for use with Opera. (It did find it.) Could that be the reason? @emka - Is this on a fresh install? Or is this with some Firefox plugins installed? Doesn't it still leave a Mozilla\Extensions folder in AppData? @zak_711: Could you please rephrase? The people who use the non-portable ZIP distribution want to run Pale Moon without installation. It's faster to just extract the ZIP file and run the browser. I think it's a kind of joke, as that zip works perfectly with WPPL and with PApps launcher. @SYSTEM I didnt undrstand the difference, about jokes, about Avira set up creator and the link i have to splitted about the toolbar. A definite favorite and my default browser. Highly recommended in both portable and non-portable versions, although you can still find good lighter/faster alternatives. What does that zip ( not portable! ) do on that site? 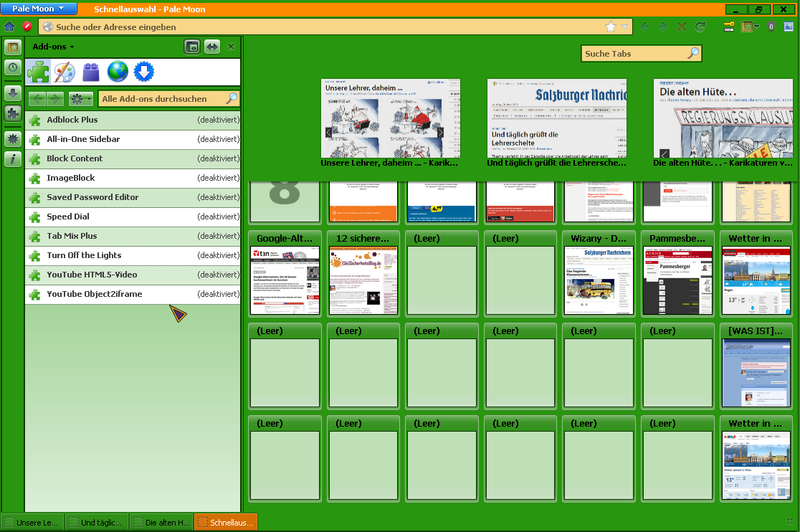 Here is another portable version with multiprofil GUI. Saw it first on this site a while ago, and decided to give ita try. Never looked back, is wonderful, very stable, lightning fast and very compatible; so far I haven't had any problems, crashes, etc, compared to plain, ol' firefox. Besides, it is very memory friendly, It has became my regular browser, even makes me to pass on Firefox 4. I highly recommend it. It definitely runs faster than Firefox 3.5+ but it seems less stable. It crashed on me numerous times. Firefox seems slow and sluggish in comparison but I think I prefer that to instability. Nice idea, though. hugh_h: compiling software for early hardware has advantages beyond simply working on more computers. Faster testing, deployment, download, and more. So let me get this straight. Regular Firefox was written to support what? The 8088 through Pentium 3? Aren't those all in landfills or running Linux by now? Hmm... Pale Moon seems to backup the passwords and bookmarks. Check out the /backups/ folder in your PaleMoon folder, my backups folder is now 120MB! Check out the .ini file to remove this functionality and reclaim your USB drive space! @grannyGreek, there are FireFox free plugins that can open and save to MHT so as long as this program can use extensions, you will be ok. Seems nice, but Firefox and all its forks REFUSE to work with mht or mhtl files. I save lots of web pages to read off-line, I use mht format so as not to have lots of html folders (and MSIE saves to mht by default). Unless some wizard knows how to force Firefox/Palemoon to use mht, I guess I will have to stand with Opera and Internet Explorer. Too bad, it seems like a very nice piece of software. I use this gem, ghostzilla and a couple of 0-trace usb-operas to keep my internettering fast, clean and happy. For this prg the Ff extensions will delete anything temp (I use click and clean which then auto-fires ccleaner).